When I moved out to Washington to begin work in the US, I ended up needing to buy my own car because of the different emissions standard. Kind of sucked but at the same time I made my first car purchase which was pretty cool. I'm the kind of guy that likes to take care of the stuff that I own so I thought it would be cool to document the stuff that I've done with my car to make it mine. The first thing I thought would be nice is a back up cam. Although I never drove a car with a back up camera before and didn't really need it, certainly could make things a little more convenient as well as a fun project. I found out that a mirror dash cam set up combined with a rear view camera you could get on Amazon for $30 which I thought was nuts. Of course getting professional installation also costs around $100-150 on the low end so I thought this would be a fun project. The main electronics in the system are the mirror (which has a display and camera inside) and the back up camera. The camera can connect to the mirror with provided cables and is purely powered by the AV-IN. This is not a universal thing, many back up cameras required 12V to run as I've seen. The only other relevant connection is the 12V to 5V cigarette power supply which is connected to the USB input on the mirror. At this point, if you connect the USB to the mirror and power it in your car, you will be able to power the device. If the backup camera is connected you can also configure whether you want to view the dash cam/rear cam or a combination of the two. In this project I wanted a rather clean look so I had to buy a small 12V to 5V converter. Connecting to the fuse box is easy, however I also bought a new fuse tap and replaced the original one in this picture. The reason was that I received the wrong style fuse in the mail. However, the one that came with the voltage converter was also of a low quality so I'm glad I replaced it anyway. I simply snipped off the original and re-soldered a new head to the red wire and used heat shrink tube around the connection. The only connections directly to the car are therefore this voltage converter and the 12V from the tail light to the AV-IN. Although this system can operate without connecting 12V from the tail light, two major features will not be active. The 12V allows automatic switching to the rear camera when setting the car into reverse. It also powers 4 LED's on the camera so that the lights shine during reversing. This isn't that important during the day, but really helps a lot at night. First thing is to figure out how to get the cable carrying power and signal to the camera outside without making holes in the car body. I decided that removing the license plate light plastic housing and drilling a small hole was sufficient. This way I didn't need to go through metal which is nice. At this point I could connect the two 12V and ground wires to the reverse tail light with the wire splices. These are just a way to connect some wires without soldering. Once this is done all the functionality in the system is active. Connecting the cigarette lighter to the mirror and the AV cable to the mirror you should be able to start the car, have the system turn on shift to reverse and see the camera automatically switch to the rear camera. In order to find right wires to splice for the reverse light, I simply removed the connector to the bulb, shifted to reverse with the parking brake engaged and measured the voltage. It should be 0V in all cases except reverse where it is 12V. The fuse tap just has two wire ends, one to connect to the high voltage at the fuse box, and another to ground which is just a bolt near the fuse box. If you're not sure which bolts are ground, you can simply turn on the car and measure the voltage between a bolt and a fuse. Now there is a small choice to make here about which fuse to connect the camera system to, and it does slightly affect the operation. If you choose a fuse that is always on, then the system will always record even when the car engine is off. I did not want it recording while the car was off so I used the power window fuse. In my car I did need to remove some trim pieces to get to the ground bolt, but I would have needed to anyway to hide the AV cable. 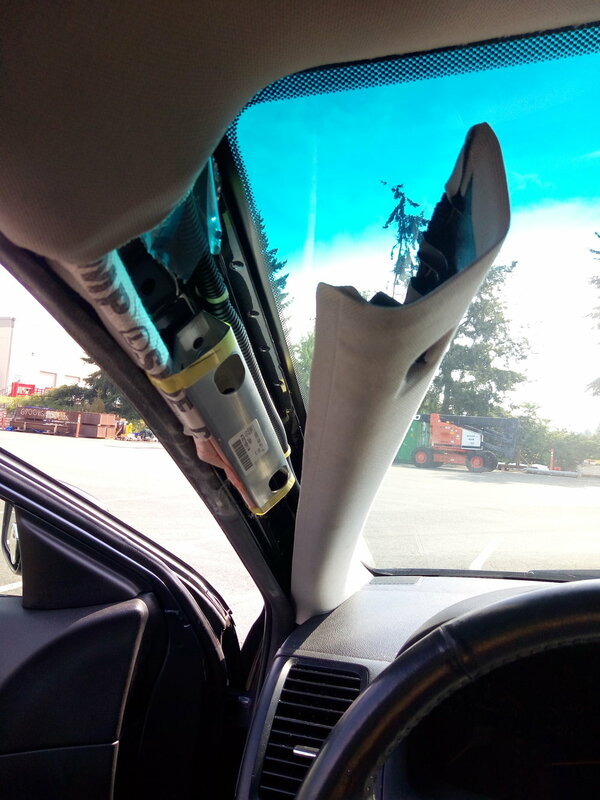 In order to make the AV and the USB connect to the mirror cleanly, you have to open up the side curtain trim which has the airbag. Since triggering an airbag will pretty much total your car if its an old one like mine, I was cautious an disconnected the battery so that the electronics could not trigger an airbag. At this point you just need to feed and run the wires to where you want them to go. I was very lucky on my car since the AV cable was exactly long enough. Had it been too short I would probably need an extender which would delay the completion of the installation, probably meaning that I would have to remove all the trim again. Buying a used car means that the car will have dings. 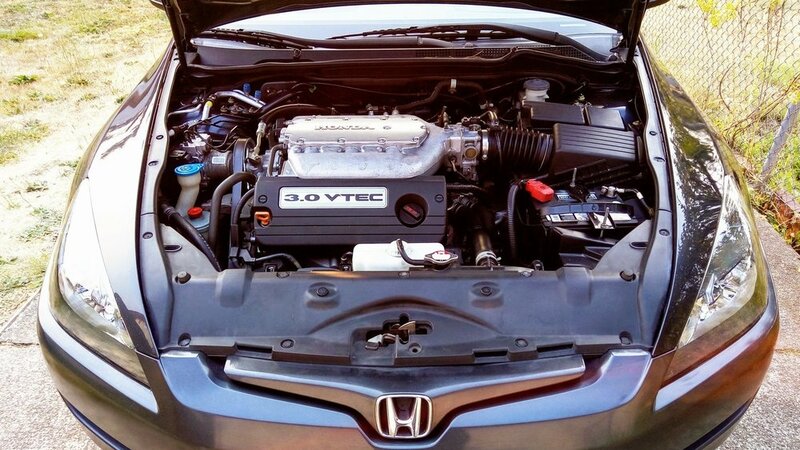 My car was actually in pretty good condition even being roughly 11 years old when I purchased it. However, of course there were a few scratches here and there as well as weathered paint. Small scratches in the clear coat which disappear with water is applied can actually be fixed without the use of paint. The basic principle is to sand the clear coat down to smooth the scratch so that the light does not reflected along the edges. Basically, using 3000 grit and wet sanding the area the moving up to wet sanding with 5000 grit followed by polishing with scratch remover gets a near perfect finish. I used a drill polisher attachment by that greatly speeds up the process as well as Scratch X scratch remover. The biggest problem with a reasonably deep base coat scratch is blending as well as getting the same textured finish. From my experience the clear coat spray bottles that I find in consumer auto centers simply are not fine enough to get the mirror finish. This could be my lack of expertise or the brands I used, but this is simply what I noticed. The texture of the spray is slightly rougher, making it look matte. Basically, I wouldn't recommend using this stuff on a very obvious area like a door. However, patching up parts near the bottom of the car or just conspicuous areas is okay.